I'm going to be honest here and admit that I've actually tried to write this recap post several times last week, and each time I've sat down and made the attempt I would end up sitting there staring at the computer screen for at least an hour. Totally stumped. How do I start such a post? Where do I even begin? Seriously, I had such an incredible, inspiring, and amazing trip that I feel like any words I use to try to describe the entire experience would, in the end, not do any justice to how phenomenal the whole weekend really was for me. Sadly, I didn't take a ton of photos, but I did take more than I would have if I had brought along my camera. So I really can't just show you a bunch of photos and let them do the talking for me. Oh well. I guess the only way I can go about this is to just dive in, yeah? The second after my travel companions and I had settled into our hotel room, we jetted out to grab a much needed cup of coffee (and snuck in a few minutes of knitting time!) and headed over to the Meydenbauer Convention Center to register in and check things out. My travel companions for VK Live: my awesome possum friend Liisa (of Socks-A-Plenty) and her co-worker (who is now a lovely new friend!) Ginny. We kept it pretty mellow on Day 1 of VK Live (mainly because we were so tired!) since we were going to be there all weekend. There were a ton of people at the Marketplace and it did get fairly busy on the Saturday, bu not once did I feel claustrophobic or like I was going to be eaten alive by knitters. I think the venue was nicely laid out with enough space to allow everyone to move around freely without the fear of being stabbed by someone's needles as they walked by. I loved how there were so many places where you could just plop down for a bit to take a breather and maybe knit for a bit. They even had a little cafe where they offered free coffee during certain hours!! And believe me, on Friday night I totally took advantage and grabbed a cup of java to perk me right back up! The collage above is of the lobby of the Meydenbauer. It was lined with hanks of yarn from Cascade. I didn't know it at the time until I read the guide book, but on the last day of the event the VK peeps were going to do a "yarn drop". That's right, all that yarn you see there? They were going to drop it all and whoever was waiting at the bottom could snag what they wanted and take it home. For free! 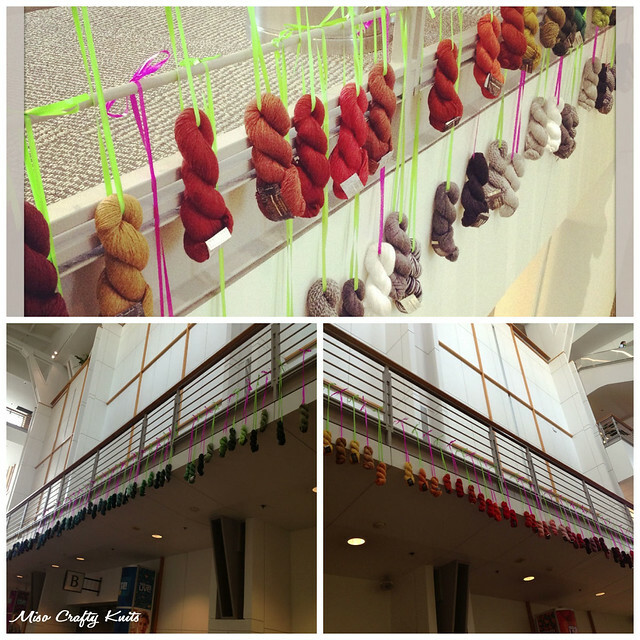 I've always wanted to know what would happen to a room full of knitters when free yarn fell from the sky. Now I know. My goal was to grab one hank as a souvenir and get the eff out. And that's exactly what happened. Because someone will ask, I had hung out under the grey section and managed to grab a hank of Cascade 220 in a medium grey shade before jumping out of the pit to watch the rest of the yarny mayhem unfold. Experience craft elevated to art. 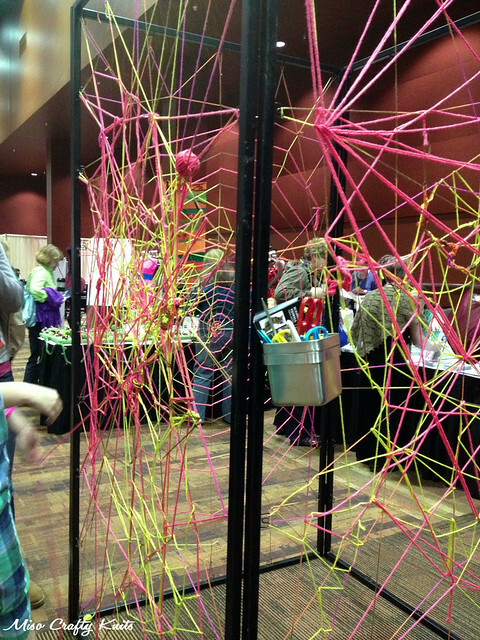 Convention go-ers were encouraged to make their mark in these pieces of art. The VK Live Marketplace was pretty much like any other knitting event that I've been to, except that the booths were more elaborate. Like little versions of what the actual shops looked like. Definitely a lot of time and care was put into the set-ups and each booth really displayed its own personality. Unfortunately I didn't take any photos of the booths (I kind of felt uncomfortable about doing so and didn't want any of them to think I was being shady or something, but in hindsight I'm sure they wouldn't have minded), but my favourites were definitely the Stash Local and Hazel Knits booths. Even though everyone was super nice and friendly, the ladies at Stash were so incredibly cute (I wish I had taken photos of all their aprons) and immediately made you feel welcomed. You can just tell that they were having a great time. 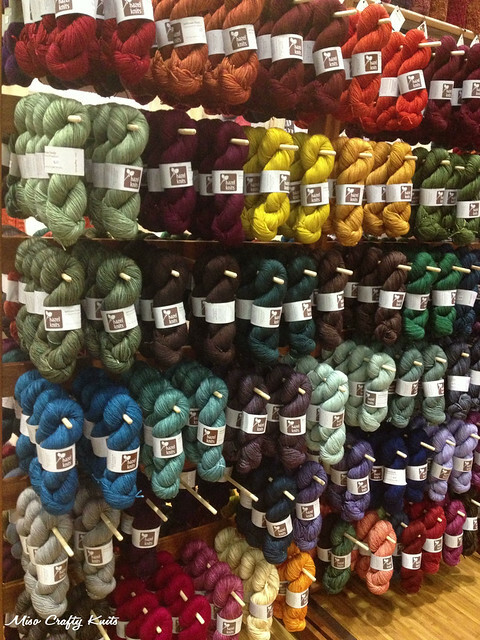 Not to mention that their booth was just so cozy that you didn't ever want to leave, it made me wish they were my LYS! 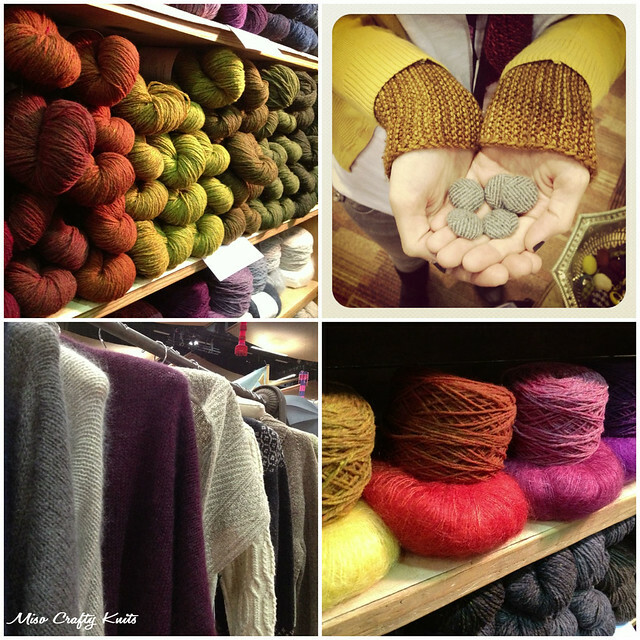 Everyone over at Hazel Knits were also pretty darn awesome, their friendly energy and all their amazing racks of colourful and delicious yarns made it SO hard to stay away! And trust me, I kept going back for more! The robots were my absolute favourites! I almost died from the cuteness of the reindeer licking the candy cane! I seriously took a million photos of this display. I just couldn't get enough of it, there was just too much cuteness going on! To see the display in its entirety (and trust me, it's huge!) 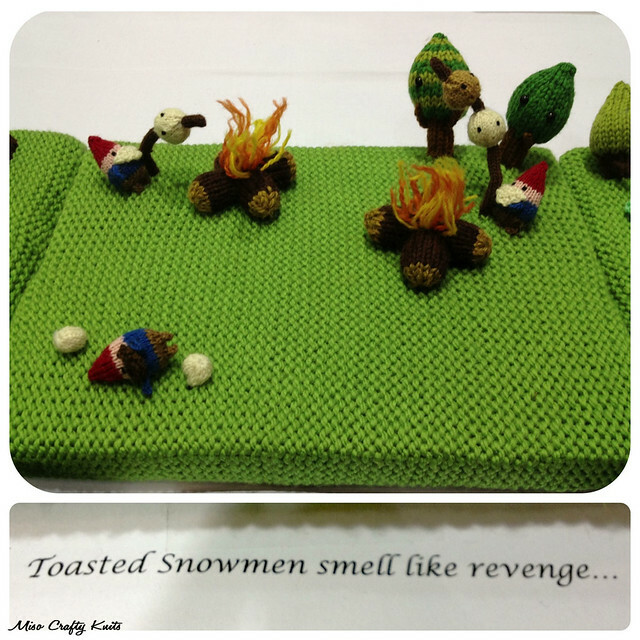 check out Mochimochi Land's blog post here for the photo. I'll admit that when I arrived at VK Live I didn't have a huge shopping list of things I'm looking for like I normally do. Generally when I go to a knitting event I'll compile lists of potential projects that I need yarn for and yardage estimates for certain garments in specific weights. This time around I was only on the lookout for Signature needles (I really wanted to look at the 2.25mm/US 1 circs) and a yarn caddy (which I found at a good price on the last day!). So I'm a little surprised that I still came back with a fair amount of yarn. I even got a sweater's worth! I totally blame it on yarn fumes! Other highlights: the insanely fluffy and overly adorable Angora bunnies of both the German and British breeds (did you know British Angora need to be brushed weekly? And that you can literally start spinning their fibre straight off from the bunny?). There were demonstrations of bunny grooming to spinning, and I think someone there was actually knitting with the resulting yarn. They also had a bunny shearing demo that made me feel a little sorry for the bunny afterwards. Poor thing was just tiny! Too bad I didn't take a single photo of any of the bunnies or the demos. 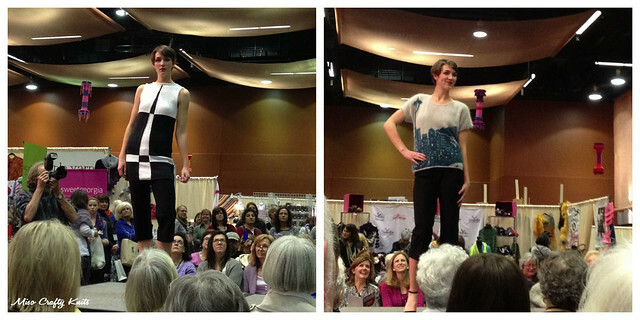 There was also free fashion shows throughout the event. I think there were 5 or 6 of them total? I only managed to sit in on one of them. I did manage to sit in on the panels held on the Sunday featuring some of the big names and experts in the fibre arts industry. The first one I literally stumbled into it, I was just roaming around the Marketplace and when I got closer to the stage a few statements bellowed out from the speakers that really caught my attention. I went from wondering over to the edge of the crowd to snagging a seat right in front. I learned SO much in that 1 hour, from branding to designing to legal rights to credibility. I'm so glad that I decided to stick around and check out the Marketplace one last time instead of heading over to a coffee shop to knit the afternoon away! Another highlight: watching Liisa compete in the speed knitting contest! 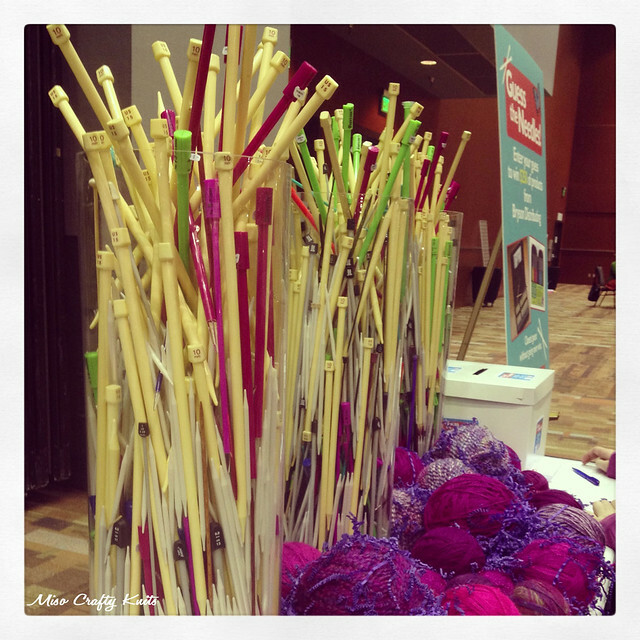 Since Skacel was the biggest sponsor of VK Live, and they are the producers of Addi needles, they decided to hold a competition for the fastest knitter in the Northwest. 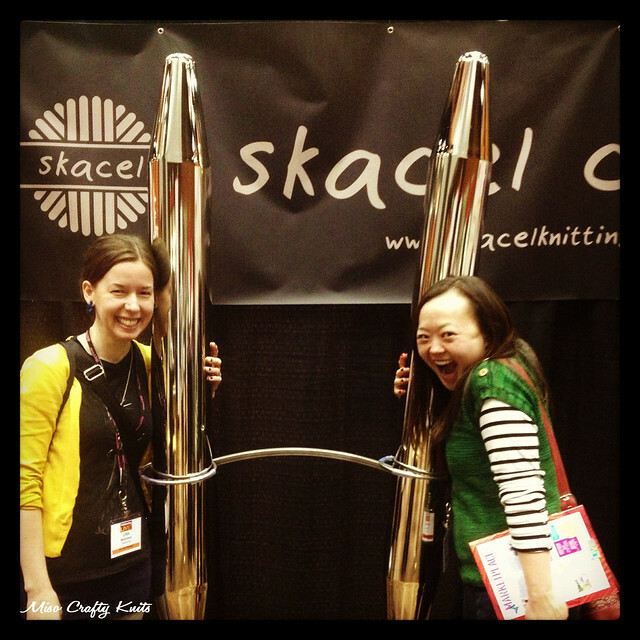 Anyone can compete by stopping by the Skacel booth and knit for 3 minutes as fast as you can. The top 3 knitters at the end of Saturday gets tickets to the gala dinner at the Hyatt Regency, where they will then face off against each other for the title. With much encouragement from everyone, Liisa competed and she made it as the top contender!! You bet she was going to the gala dinner!! 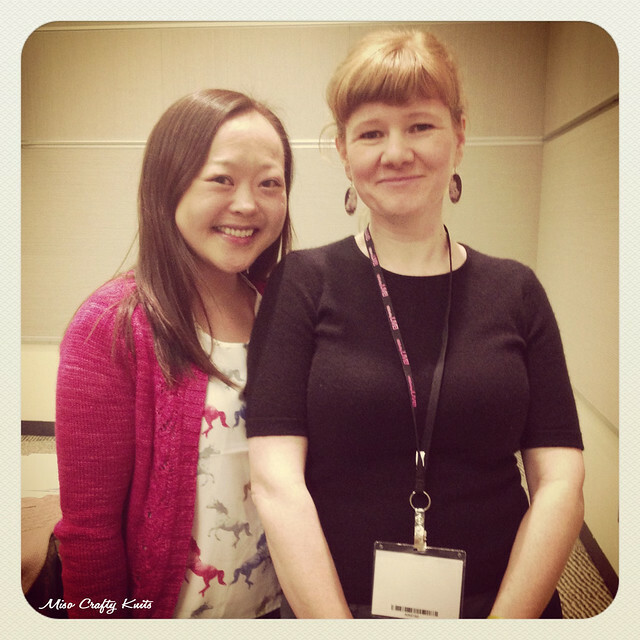 I was feeling totally nervous for Liisa, so I could only imagine how Liisa felt herself! All night we were wondering how she did, luckily my group of friends that I was chilling with that night decided to head back to their hotel (which was conveniently the Hyatt) and we ran into Liisa. Who was holding her glorious trophy!! Liisa won!! Liisa is the Fastest Knitter in the Northwest!! 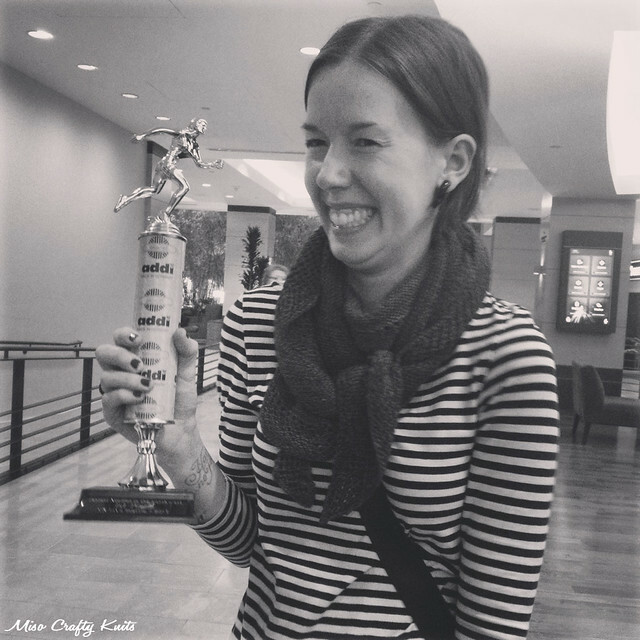 I wish I was there to see her compete, but no big deal, it's not like I've never seen her knit before! You can read Liisa's view of VK Live and her whole speed knitting experience on her blog here, and you can watch the video here that was taken by Felicia of SweetGeorgia Yarns, and you can read Felicia's account of VK Live on her blog here. Introducing the Fastest Needles in the Northwest - Miss Liisa!! So, so exciting!! And look at that trophy! I wish I had also taken a photo of the blinged out pair of circulars that all the Gala attendees received. Seriously, they're worth like, $100 a pair! Crazy! I know I own some pretty pricey needles, but that's just over the top! Anyhoo, I'm sure there is a ton more that I'm missing out on mentioning, but this post already seems pretty darn long. So I'll just move on with the program. 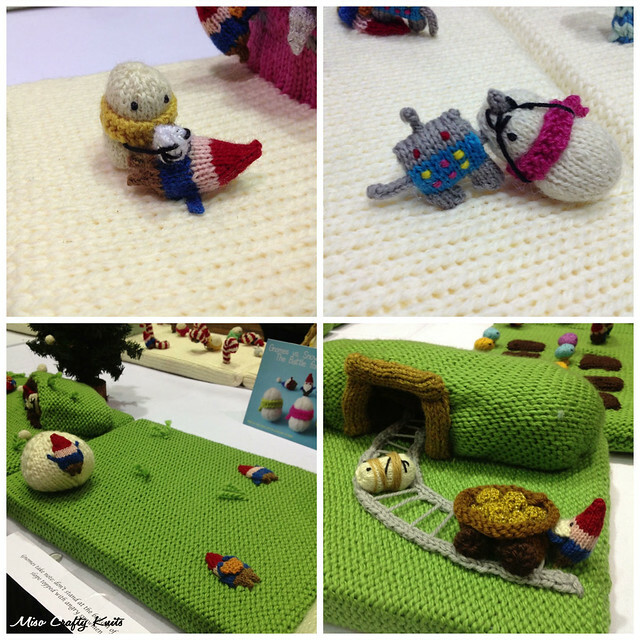 I really wasn't expecting or even thought that I would see any "knitting celebrities" but lo and behold there was a plethora of them hanging out in the Marketplace and roaming about the convention center! Vickie Howell (who I think is very recognizable) was teaching beginners how to knit and crochet in the Beginner Lounge, Nicky Epstein was seen several times chilling out and thumbing through stitch dictionaries at the Vogue Knitting books table, and Josh Bennett (who was wearing a very warm looking but gorgeous hand knit sweater...and I have to say, was looking in general very good...if you know what I mean!) was in and out of the Marketplace in between his classes (if I had the cashola, I would have loved to have taken his "Tips & Tricks" and "Custom Knitting" classes). 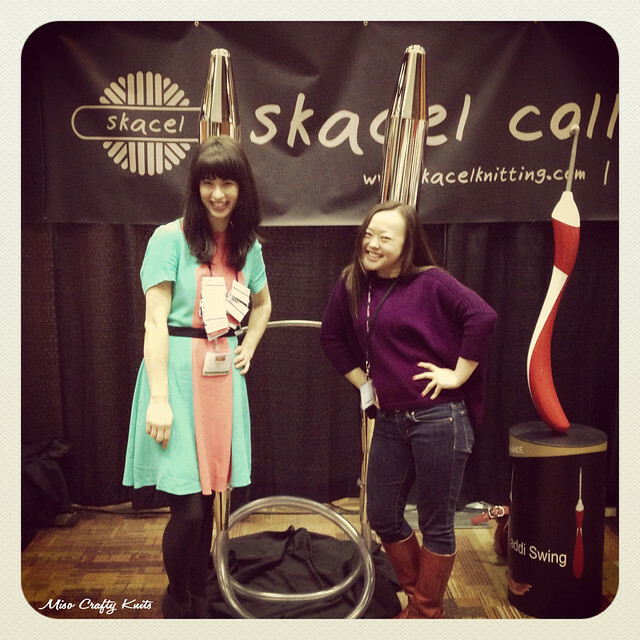 With Cirilia Rose in front of those massive Addi circulars! Hand knit #2 - and yes, that there is a finished Boxy pullover! I met Cirilia Rose. First off, can I just say how fabulous her hair is?? I don't think that girl has ever had a bad hair day in her life!! And she's always so well-dressed. Very funky. And to top it all off, she's the sweetest.person.ever. So nice. I'm still in awe! I think I creeped her out though. I first spotted her at the Skacel booth and I froze. Then I did the weird stalker thing and kept walking past just staring at her. Several times. Then whenever she looked at me I freaked out and would quickly look away. I really don't know how long or even how often I did this because eventually she caught me looking at her - again! - and gave me friendly smile and little wave. I finally had the balls to approach her. I really don't know why I was so nervous to talk to her, she was just so nice. In that "cooler older sister" kind of way. 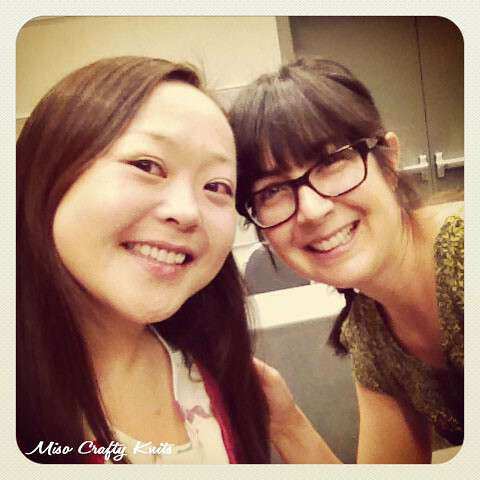 I almost died when she told me that she had seen my blog and then proceeded to tell me her story about miso paste. I just really hope I didn't make an arse of myself in front of her! With Gudrun Johnston after the Seamless Knits class. Hand knit #3 - my own seamless design!! I had THE most fabulous opportunity to take Gudrun Johnston's Seamless Knits class on the last day of the convention (a millions thanks again Felicia!!!). Even though there were quite a few classes at VKL that I would have loved to have taken, I just didn't have the budget for it. Heck, I had to scrape together all my pennies and then some to come up with a decent shopping budget. Then Brett offered to pay for a class as an early Mother's Day present but by then the 2 classes that I had really, really, really wanted to take were already full, so I had signed up for only 1 lecture. Imagine my sheer delight and gratitude when the last minute offer to take a friend's place came up to take one of the classes that I coveted! I didn't even care that I had to scramble to find the materials I needed for the class or that I had homework that needed to be knit up! I was beyond excited!! And so that's how I met Gudrun Johnston. With Jarod Flood, Mr. Brooklyn Tweed himself! The night before (Saturday night) I went out for dinner with a bunch of friends (it started out as 20 of us but because no restaurant could seat us quickly enough our number dwindled down to like, 12 people). Since we were all knitters and all there for VK Live it was only natural that knitting came up in conversations quite often. I don't remember how we got onto the topic of Brooklyn Tweed and Jarod Flood (I have a feeling it had to do with a certain person's Facebook status ::coughLiisacough::), but I do remember saying that Mr. Flood "is like Prince - he farts magic". And I mean that in a good way. As in they are both so talented that everything they do turns out fabulous, even their farts. Well, fast forward to the next day when I finally had the chance to meet Jarod Flood face to face (and not do walk-bys where I walk extremely close behind him and breathe in deeply, hoping to take in some of his aura - PS: he smells good). You see, Mr. Brooklyn Tweed himself has been hanging out at the Churchmouse Yarns & Teas booth all weekend, he was seriously THE main attraction of pretty much the entire event. Not a moment went by where he was not by himself. There was always a knitter there by his side. Since it was the last day of VK Live I figured it was now or never to go up to him. Well, let me tell you, verbal diarrhea was at its best the second I had his attention. I could feel my face get redder by the second, my body temperature was through the roof, my freakin' hands were so slick with sweat that when he shook my hand I was positive he would have to wipe his own hand immediately after (which he didn't), and I was so incredibly flustered that I had no control over my brain...or my mouth. Cause guess what I did? Yep. I told him he was like Prince and that he farted magic. Unfortunately the Universe did not hear my silent pleas and the floor did not open up and swallow me whole. Ugh. Could I be any more awkward? Wow. But you know what? Jarod Flood is not 100% perfect! He spelled my name wrong. I feel a little better now. Just a little. I totally want her last name. And her cardigan. And her tattoo. Anyhoo, another really cool "knitting celebrity" that I met: Rebecca Danger, the designer/creator/mastermind behind those insanely cute knitted monsters. I've been following and chatting with Rebecca on Instagram but have never met her in person, so it was great to finally meet her and not feel like I'm cyber-stalking her. Rebecca is insanely nice, bloody hilarious, a pretty good navigator (she claims she isn't, but she got us to our dinner destination without flaw), and shares the same work/life balance woes that so many of us have. I totally forgot to take photos of our group dinner and the impromptu hotel lobby knit night that followed afterwards, but I got my chance to take a photo of me with Rebecca on the Sunday when I spotted her roaming around the Marketplace after her book signing! Thanks Rebecca for not laughing at me while I tried to calm down from my encounter with Jarod Flood! 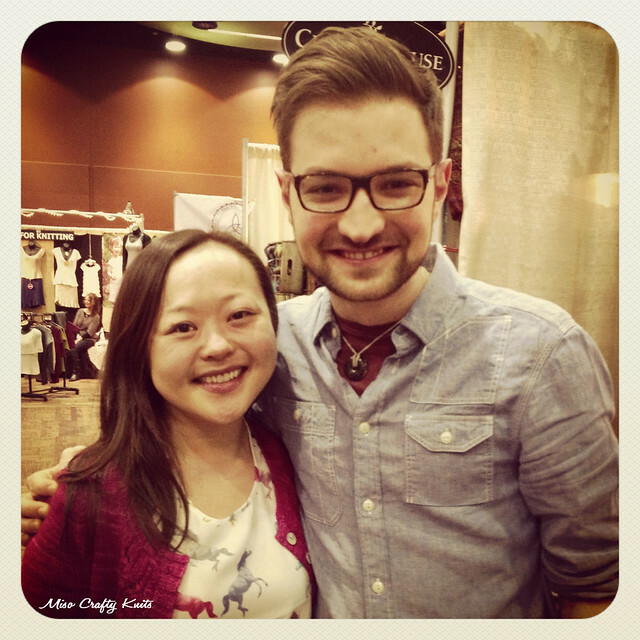 I also had the chance to meet a few readers and Facebook page followers! Like Anna, who sat next to me in Gudrun Johnston's class (and was wearing a fantastic coat that I couldn't stop admiring before class started) and had brought along her gorgeous Levenwick to show to Gudrun. Hi Anna! I didn't get to take any photos with her, but I also got to meet Ashley, who was the winner of the very first project bag giveaway that I did when I opened my etsy shop. How cool is that? I also met 2 very cool ladies (one wearing a fabulous vintage dress and the other a gorgeous purple Veera Valimaki cardigan) but don't remember their names - I'm so sorry ladies! I am horrible with names!! Please, if you are reading this, leave a comment with your name and which of the outfits you were wearing! I remember briefly talking about yarn fumes and how to discreetly hide yarn on your persons before entering the house (like I would know anything about that...ahem...), as well as a quick chat about knitting needles and sock knitting (someone saw the first Instagram photo of the stripey socks being cast on!). Other people that I met but didn't take a photo with: Alexa Ludeman, one of 2 designers behind Tin Can Knits; and Emily R, the super cute model for Tin Can Knits (and not to be confused with Emily W - the other half of the designing duo of Tin Can Knits). While they're not people I've met for the first time, I did get the chance to hang out a fair bit with some other friends who are also from Victoria, and one friend who I haven't seen since Knit City (who has once lived in Victoria, but no more). When I get the chance to (and it's not often due to Brett's work schedule) I go to a Saturday knit night with fellow moms who have also made crafting their careers. It's funny how we live in the same city and yet I don't see them that often. We have to go to another city, in another country in order to hang out. Ftw! It's crazy! But everywhere we went it seemed like an endless knit night. Now what knitter wouldn't want that?? 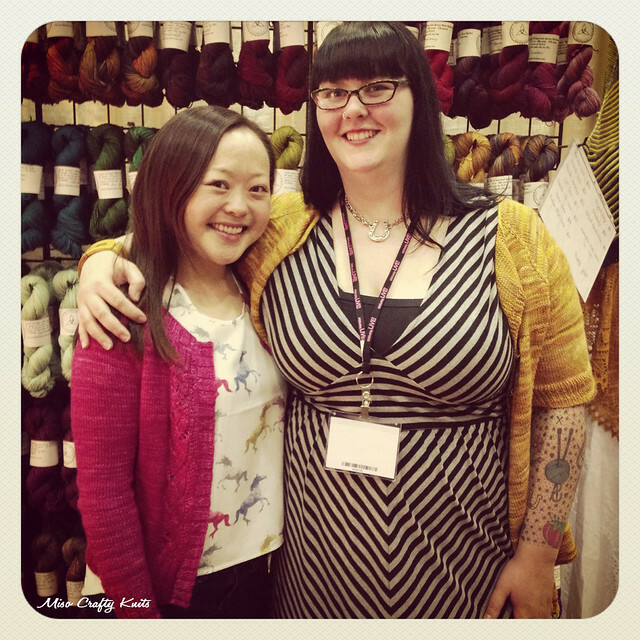 So it was really nice and mega fun to hang out with knitting machine Rebecca (of Nook. ), Aja (of Swelldove - and I swear, the more we talk about our kiddos, the more I realize we have the same little boy), Jane (yes, THE Jane Richmond), Shannon (of luvinthemommyhood), blogless (but still quite lovely!) Cate, and my sister from another mister Arika (who is also blogless). Hi ladies!!! Bottom: Alexa, Ashley, Emily R, Jane, Shannon, Cate, and Aja. Arika, where are you?? Sorry ladies, these were the ONLY photos that I got of you all. Wtf? Note to self: take more photos of friends and companions...and of myself with said people! So sad that the photos above are the only ones I got from the entire weekend. So shameful! Oh man, where do I even begin with this one? I guess I'll start from the beginning with the lecture I took Friday afternoon with Vogue Knitting Editor-in-Chief, Trisha Malcolm. Lecture topic: How to Be a Knit Designer. Yeah, I showed up thinking I was going to be sitting there for at least an hour knitting away while I listened to a knitting magazine editor yap away. That was SO not the case! I'm extremely glad that I shoved my notebook and a pen into my bag before leaving the hotel, cause I ended up sitting there from the start of the lecture to the very last second scribbling away as fast as I could trying to write down everything that Trisha Malcolm had to say. At one point my hand was cramping so badly but I didn't dare to stop, for fear that I would miss something crucial. And trust me, it was ALL crucial! I don't want to give away her entire lecture, so I'll just mention a few things that really stuck out and struck a cord with me. ♥ Settle on an idea. Crafters are generally highly creative people, whether you think you are or not. And all too often we want to do it all. 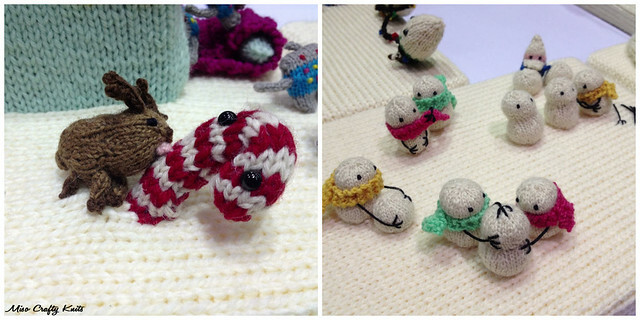 We want to knit. We want to sew. We want to cross stitch. We want to scrapbook. We want to solder our own jewelry. You get the point. Well it's all fine and dandy to have several crafty interests but when it comes down to making a business and/or career out of it, it's ideal for the creative brain to concentrate on one idea...and master it. That might sound boring for those who love all sorts of crafts equally, but the point that Trisha Malcolm had about this: you can have 2 or 4 ideas and run with it, but it usually means you'll end up with 2 or 4 mediocre ideas. You're too busy trying to maintain all these ideas that you could miss out on seeing and working the opportunities within one idea that could develop into something phenomenal. I can totally see her point. ♥ Knit. A lot. This seems obvious, but even the panels I sat in on had mentioned the need to keep knitting. Designers had even admitted that even though they don't have the time to do selfish knitting, they still like and encourage others to knit patterns that aren't your own. It can inspire and refresh you in so many ways. 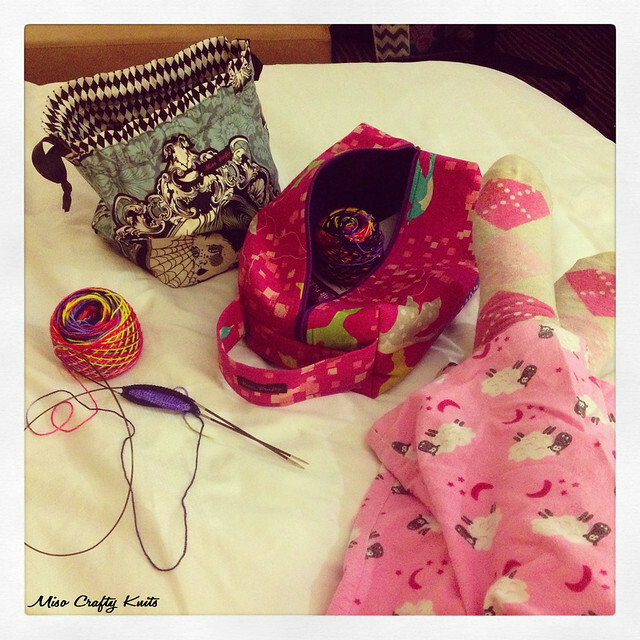 The panel had also mentioned to expand your knitting experience - never knit a sock before? Try it. Basically know your craft. 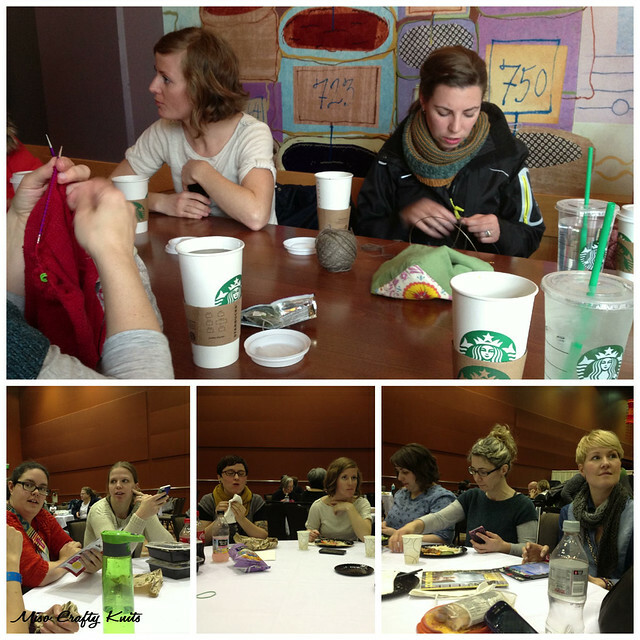 ♥ Be collaborative, not competitive with your peers. This was a big one that stuck out, cause I see it all the time. I'm always so scared to ask for help cause the times that I have no one was willing to say a word. Then I met people like Jane and Em who have been more than helpful because they know exactly what it was like to be in the same position (thank you ladies!). Very often people get very secretive with what they are doing for fear that their ideas are going to get ripped off, or they develop relationships where it's a matter of "if you scratch my back, I may scratch yours". Never get yourself into a position where you only think about what the other person can do for you, or where you start a running tally of how many good deeds someone has done for you and vice versa. Obviously, there are limitations! A good example of great collaborating: The Shetland Trader. This book of knitting patterns were designed by Gudrun Johnston, modelled by Ysolda Teague, and photographed by Jared Flood. All three design women's knitwear, yet all three were able to come together to create one beautiful book. ♥ The value of free. Sadly, regardless of the craft, people expect things to be free. Or they try to get the things for free. This in turn pressures a lot of designers and crafters to either offer free things or lower price points. A few issues came up when it came to the talk of free: a person offering their patterns for free could make them look more like a hobby knitter than a professional - saying something is for free is saying the work (or time) has no value; usually patterns that are free are simple, basic, and most likely not tech edited or test knitted; once you offer free people expect it to always be free. Now, I'll admit that I think there's a fine line to all of this...I think some people are truly passionate about knitting and I don't think the patterns they offer for free are any less in design or quality than those you pay for, and I thought maybe Trisha Malcolm was being just a little harsh. But then she brought up another point (which the panels had also brought up and reiterated too) : how much is your time worth? Granted, if you are an established designer and you whipped up a simple garter cowl and wanted to offer it as a free pattern to those who have supported your work, that's apparently fine. Supposedly you shouldn't be charging for extremely simple and possibly basic patterns, like a stockinette tube top or a 2x2 ribbed cowl, because those have been done and consumers could feel cheated for having to pay for basic. But it totally makes me wonder who gets to say what's simple, what's basic. See? I think it's a fine line. But the whole point - for those who expect things to be free, ask yourself: would you want to work for free? Someone had to write up the pattern, regardless of how simple it is. Someone had to edit the pattern and figure out the layout. Someone had to take the photos. Someone had to upload it to Ravelry. Someone had to work. There were a few times that I thought Trisha Malcolm was being a little harsh, but the more I thought about it (and trust me, my brain was working overtime after the lecture), the more I realized that she was just being straight up frank. Because really, everyone is busy and everyone is trying to do their thing, but if you're not willing to do the work yourself don't expect others to hold your hand and baby you along. ♥ Build credential. The panel had talked about how they've met countless people who wanted to be designers, company knitters (knitters who test knit or knit the samples for a specific company), event instructors, the list goes on, and yet these people don't have anything to back them up. A person can claim they've been knitting all their life but if their stack of knits consists of nothing but hats, scarves, and dishcloths then it's hard to take them seriously when they come out and say they're a sweater designer. 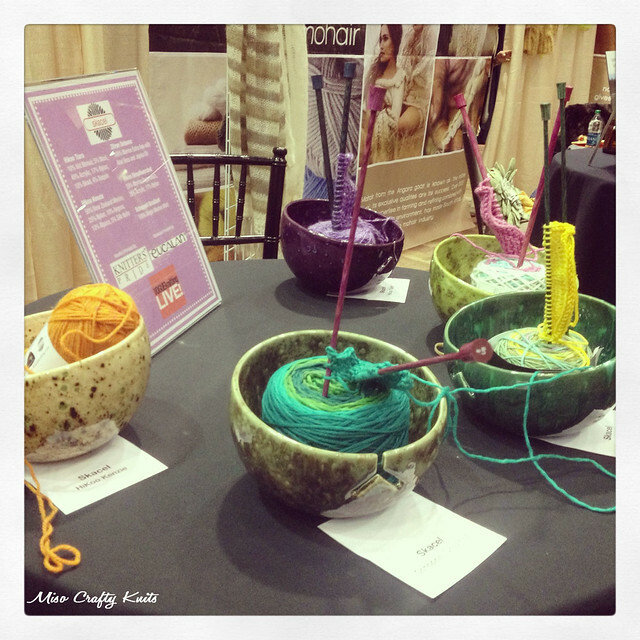 One of the yarn company owners had talked about how when she first got into the business of knitting she had a hard time getting people to accept her work since she was barely a step ahead of the game. She realized no one wanted to learn from someone who had just learned the lesson themselves a few days before. It all basically ties into the whole "knit a lot" and know your stuff philosophies. If you want to be a sweater designer than go and knit a ton of sweaters, know all the different techniques of how to set in sleeves, how to knit the various short-row methods, etc. You don't see people questioning Cookie A and her knowledge of socks. The Seamless Knits class that I took with Gudrun Johnston was absolutely awesome. I learned a whole new way of knitting short-rows, a whole new way of how to knit shoulder shaping, and how to knit a continuous set-in sleeve (it was genius!). By the end of the class I had knit cute little half samples of 2 different ways to knit sleeves seamlessly. One method I already knew, since I've already knit 4 cardigans using that method - but I did pick up a few tips and tricks to achieve better results that I can't wait to try out. Proof that knitting did happen during this trip! Phew! That was a lot and I haven't even started talking about my haul! But you know what? This post is already insanely long enough as it is, I think I've spent way too much time trying to write this all up, and I have to say I'm getting pretty ravenous. So I'm going to have to write about my VK Live purchases another day. I hope this post will be enough to tide you all over for now! The only things I didn't mention was regrets. Did I regret anything? No, not really. I kind of wanted to do the Fitting Station, where you get fitted by a professional (no guessing if your measuring tape is twisted or if you got the right number for your center back! ), but it was always so jammed pack full of knitters that I knew that if I sat around and waited for a turn that I most likely would have been there for a few hours. I am a little bummed that I didn't get to try out or even see the Signature circular needles in the 2.25mm (US 1), but no big deal as I ended up buying a pair of Addi's newest needle on the market, Sock Rockets, and have already knit a sock with them (for the record, they are awesome!!). But other than that, I have no regrets. Yes, I could have spent less, but that's not really a regret. Did I have a good time? No, I didn't - I had a fantastic time!! Would I go again if Vogue Knitting Live came back to Seattle or even closer to home (like Vancouver), oh hells yes I would!!! 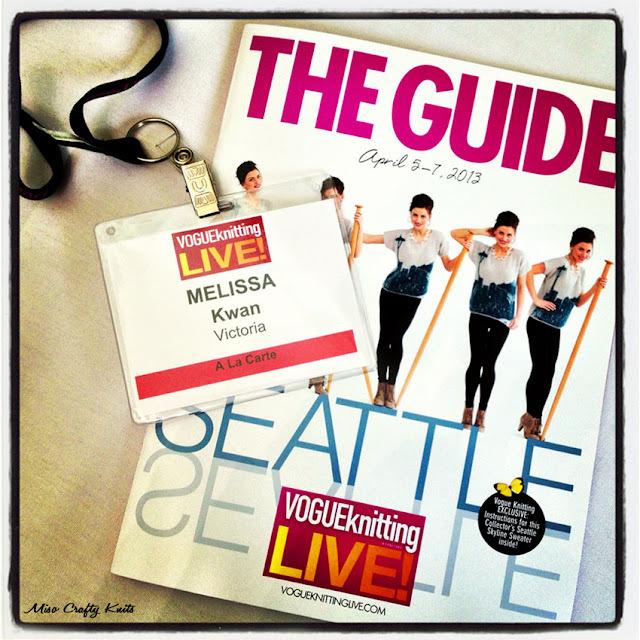 I'm patiently waiting for Vogue Knitting to announce that they'll be back in the Pacific Northwest, and soon! 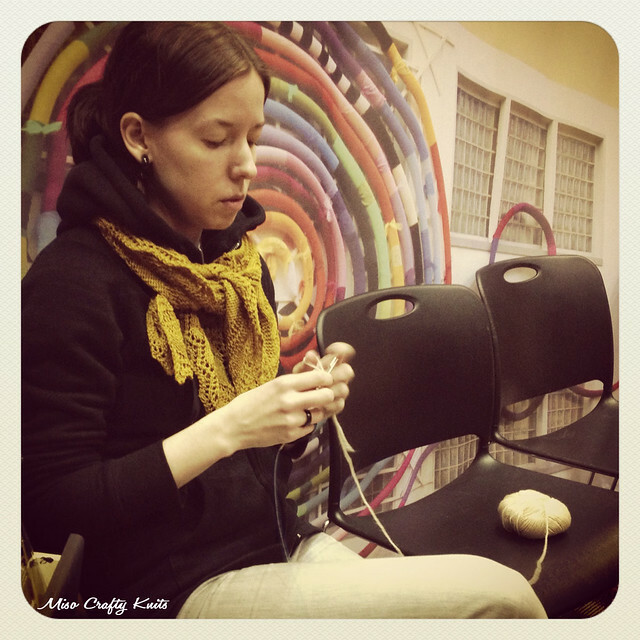 In the meantime though, I'm getting pretty amped up for Knit City. Hmmm...anything else? Did I miss anything? I hope not! Ok, this knitter is beyond famished now. 'Til next time Friends!! Thanks Shannon! :) It's so hard to jam an entire weekend crammed full of stuff into just one post! I can't wait to see your post and what photos you snapped too! BTW, I have officially finished reading through your entire blog.The. Entire. Thing. Wow.